Aside from educating the younger generation about Honesty, Accountability, Good Governance, Integrity and Transparency (HAGIT), it is also our objective to give tribute to those who stood up and fought for the HAGIT principles. Dear readers, we would like to introduce our first HAGIT Hero, Mr. Danilo P. Pacaña. Who is Danilo P. Pacaña? 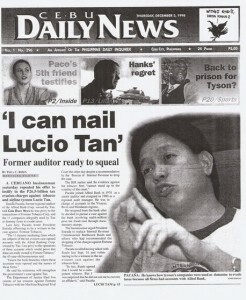 Danilo P. Pacaña (born March 16, 1955 in San Isidro, Leyte) is a patriotic crusader, was the first Filipino who filed tax evasion charges against tycoon, Lucio C.Tan, the world’s 512th billionaire and 2nd richest man in the Philippines as of 2011,with the Bureau of Internal Revenue. Likewise, he was the only citizen who charged Tan and cohorts led by BIR Commissioner Jose Ong for criminal acts due to corruption with the Ombudsman and all the way to Sandiganbayan. Single handedly, he faced Tan, represented by highly influential lawyer Atty. 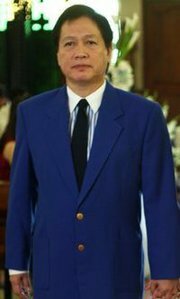 Estelito Mendoza (legal counsel of the high and mighty namely President Gloria Arroyo, President Joseph Estrada, First Lady Imelda Marcos and tycoon Eduardo Cojuangco), in a legal battle that spanned 15 years. His advocacy for corporate integrity and good governance drove him to the labyrinth of massive corruption in the bureaucracy, which went all the way to the doors of Malacañang. Danny served 2 of the top tycoons in the Philippines – Lucio Tan and Alfonso Yuchengco – as a management executive of their firms that belong to the top 10 banks and insurance companies in the country for 16 years. A Certified Public Accountant (CPA), he was formerly Senior Audit Examiner of Far East Bank, Regional Audit Head of Allied Bank, Agency Manager of Prumerica Financial and Vice President -Marketing Operations Head of Grepalife in Vismin. Thereafter, he was hired as Consultant to Prumerica Financial and Grepalife after his employment stint. He landed 10th place among the CPA board examinees from Cebu in 1984 and topped the Officer Development Program in Allied Bank. As a Champion Agency Manager of Prumerica Financial, a multinational life insurance company, he received various corporate awards for management and sales excellence given during annual conventions in the USA, Hawaii, Greece, Thailand, Korea and Phils. During his youth, Danny received the Gerry Roxas Leadership Award. A civic leader, he was awarded Most Outstanding Rotary Club President by Rotary International –District 3860 among almost a 100 clubs in the Visayas and Mindanao during his stint as President of the Rotary Club of Cebu Midtown. He is a board member of the Order of the Knights of Rizal-Cebu City Chapter with a rank of Knight Commander of Rizal. Currently engaged in business consultancy, he is President/CEO of Noa Bizkonzult. Danny was widowed at the age of 39. He is now happily married to the lovely Neperquin and is blessed with 8 children and a supportive son-in-law. He asked BIR Commissioner Kim Henares to conduct an “honest-to-goodness investigation” of these firms to collect the correct amount of taxes from them. Pacaña said he believed that the case was the “mother of tax evasion cases in the country’s history.” The tax evasion had allegedly gone on for at least 20 years, he said, and had cost the government (250) billions of pesos. Danilo Pacaña said the bank’s tax deficiency was assessed P213 million, but Allied Bank didn’t pay a single centavo after then BIR chief Beethoven Rualo dismissed the case in September 1998. He said he volunteered to testify on FTC’s alleged practice of using dummy firms but he later backed out when he noticed that the BIR would also dismiss excise tax cases against the firm. But 13 years after, he said the practice apparently continued. In his affidavit, Danilo Pacaña claimed that FTC-PMFTC created at least seven dummy marketing firms to under declare taxable transactions to pay minimal excise taxes from 1986. He said his information came from the firm’s former senior salesman assigned to the Visayas office who retired recently after 30 years in the company. The salesman, whose name was withheld, allegedly issued receipts and sales invoices and deposited the sales to the accounts of the alleged dummy firms in Allied Bank. Pacaña said the funds eventually ended up in the bank’s branch in Binondo. Pacaña said ABI also used dummy firms as marketing arms to evade payment of correct taxes. He said he was provided a confidential memo issued by an ABI official to managers of the alleged dummy companies on Feb. 29, 1996, instructing them to “conceal and remove any information that provide paper trail” on the firms’ ownership. The memo was given to him by Elpidio Que, former ABI regional sales manager in Luzon who was terminated in 2007 after working in the firm for 30 years. The utmost vigilance of the people in monitoring the BIR how FAST and how MUCH is the amount of tax deficiency assessment they will COLLECT from Tan, assuming no “MIRACLE’ happens along the way. More so, that the BIR is keeping these dummy firms secret from the eyes of the public. 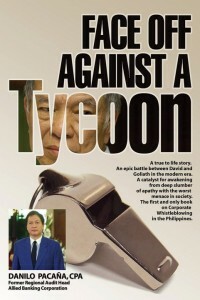 This is a true to life story…an epic battle between David and Goliath in the modern era…the first and only book on Corporate Whistleblowing in the Philippines today. At the prime of his banking career, he was “eyes and ears” of a highly powerful tycoon, Lucio Tan, who is currently the world’s 512th billionaire and 2nd richest in the country. He uncovered a multi-billion tax evasion scheme in the banking industry and reported the same directly to the country’s President, Corazon Aquino. This was his nationalistic response to her call for help from the citizenry in the gigantic task of nation building devastated during the regime of deposed dictator President Ferdinand Marcos. Consequently, he was caught in the labyrinth of top level graft and corruption, economic sabotage, death threat, betrayal, espionage, favor swapping, greed and influence peddling orchestrated by the high and mighty all the way to the doors of the nation’s seat of power…Malacanang! Alone, he charged against the giants for years, stumbled but stood up again until the very end against all odds. The family wallowed in extreme poverty and lived in fear. He lost his wife, promising career and friends along the way…but not his heart for good over evil for the sake of many. Battle-scarred, he is back to expose the worst menace in society….this time by the might of pen over sword. In the hope for people’s awakening from deep slumber of apathy with the worst menace in society and injustice!